THE loss of Eoin Donnelly to a black card for an innocuous ninth-minute misdemeanor caught up with Fermanagh as a see-saw tussle developed yesterday. While the Ernemen absorbed the loss of their key midfielder and inspirational skipper in the first half to lead 0-7 to 0-3 at the break, Galway's mastery in centrefield throughout the second period had a crucial influence on the game. With Donnelly absent, Paul Conroy ruled the roost. He set up the game's only goal after just 11 seconds of the second half and a point as the Tribesmen pulled away in the last quarter to record a six-point win. 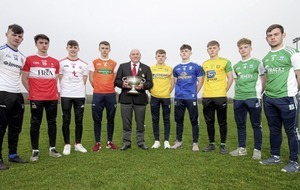 Afterwards Fermanagh manager Pete McGrath admitted: “The referee (Mayo's Jerome Henry) didn't beat us” but he was aggrieved at the loss of the influential Donnelly. “I don't think the black card was brought in for something as inconsequential as that,” he said. “No-one saw what happened, it wasn't a scoring opportunity, nobody had the ball and it was away on the far side of the field. I don't know what he did, it seemed like nothing and then the referee sends off the captain of the team, one of the most influential players we have… It just does not make sense. 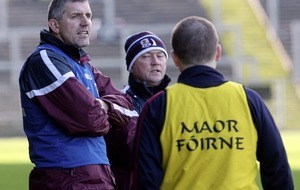 On a bitterly cold day in Enniskillen one Fermanagh supporter quipped at half-time that “Arlene should have sorted us out with a couple of heaters”. Up to that point the First Minister's native county had been in command, but that changed after Galway pushed up on them in the second half and forced goalkeeper Chris Snow to abandon the short kick-out strategy that had served the team well in the first period. “As the second half wore on Galway's sheer size and their kick-out options wore us down and in the last 15 minutes they were worthy of their win,” said McGrath. Meanwhile, Galway manager Kevin Walsh added: “Fermanagh scored nearly everything they struck in the first half so the scoreline maybe didn't do us justice at half-time. With a haul of 1-10 Walsh's side, without their Corofin contingent and injured talisman Danny Cummins, was consistent in the second half, but they took their time to get going. Two Fermanagh attacks had been snuffed out before Aidan Breen gave the Ernemen the lead after from the right wing after four minutes. One of the pivotal moments came in the ninth minute when Donnelly was black-carded but Fermanagh retained their focus and Barry Mulrone snuffed out a Galway goal chance as the visitors threatened. The Ernemen broke and Eddie Courtney – full of clever running in the full-forward line alongside Tomas Corrigan – swung over his first point of the half. 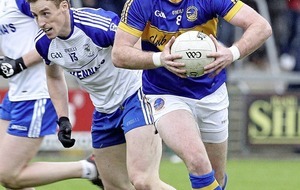 With Che Cullen winning his personal duel with Damien Comer, the visitors' search for a score was extended until Michael Daly lashed a goal chance over the bar the 15th minute. Midfielder Conroy had them briefly back on terms and points from Courtney and Barry McHugh left it all-square after 20 minutes. From there to the break Fermanagh held sway. Corrigan's superb free from the right touchline was followed by three points from Sean Quigley that sent the home side in 0-7 to 0-3 ahead at the break. Things went awry from the restart though. Conroy was fouled and immediately launched the free into the Fermanagh square. Comer rose above Cullen and lashed the ball past Snow and suddenly there was just a point in it. Although Barry Mulrone doubled Fermanagh's lead, McHugh and Eamon Brannigan scores left it level and Snow saved well from Comer before a Corrigan free edged Fermanagh ahead once again. 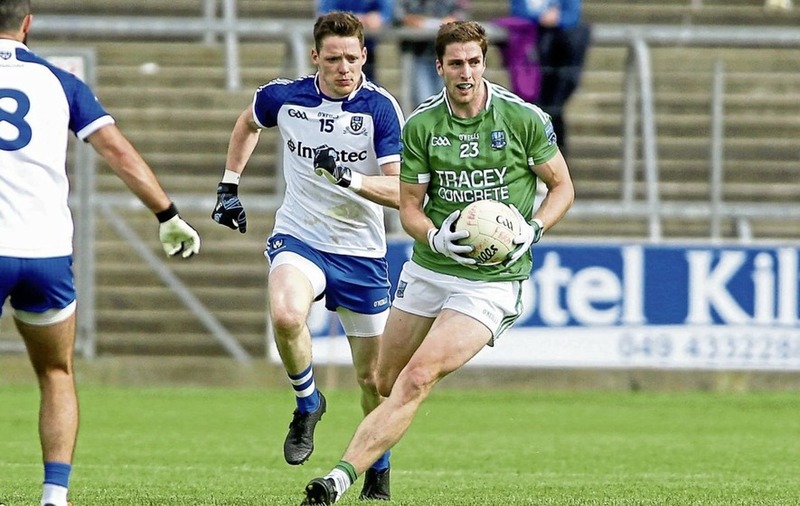 But Galway's physicality became an increasingly evident and Fermanagh's cause wasn't helped by their erratic shooting – seven wides in the second half. The Connacht men went man-to-man for kick-outs and, with Conroy in control at midfield; they scored the next seven points. Daly's double had them ahead for the first time and he added another to extend the lead. Then Conroy grabbed Snow's kick-out and charged forward to add another and Thomas Flynn's borderline effort also raised a white flag. McHugh's free meant Galway led 1-11 to 0-9 with five minutes left and Fermanagh were denied twice by goal-line blocks from Declan Kyne as they searched desperately for a way back into the game. First the Clonbur clubman got between Corrigan's shot and the net and when Courtney (who had been denied by goalkeeper Lavelle minutes earlier) grabbed the rebound he was in the right place to keep out his shot too. Kyne got away with blatantly picking the ball off the ground as Galway scrambled it clear and Cian McManus was red-carded as Fermanagh's frustration boiled over. Comer added two more points in between a Lee Cullen effort for the home side and referee Henry had to be ushered off the pitch as the home support vented their spleen at the final whistle. Next up are trips to Cork and Kildare and they'll hope for better fortune as a cut-throat Division Two takes shape.